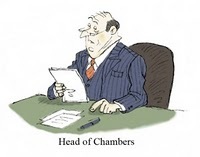 “My son’s just got a place at university to read law,” said HeadofChambers proudly today. “Some future he’ll have,” said BusyBody. “Not when half your high street solicitor clients may end up going bust after they’re banned from paying referral fees for cases next April,” said TheVamp. “It’ll just end up being a redistribution of wealth between the forward thinking firms and those stuck in the past,” said OldSmoothie. “Natural wastage”. “And even for those cases, the newly formed mega-sized alternative business structure solicitors may well just decide to use in-house barristers and keep the money for themselves,” said TheVamp. “In which case you’ll also become natural wastage if you’re not careful,” said BusyBody looking at OldSmoothie. “So do you suggest that I turn down a guaranteed income of say half a million a year whilst you sit on your own desert island touting for business?” said HeadClerk. “But we’ve all got mortgages to pay,” said UpTights. With which there was silence.